Facebook recently released version 3.4.1 of its Facebook for Every Phone Java app. It doesn’t really work on EVERY phone (it failed on one of my three test phones) but it works on a lot of them. The jad file has been modified to hide the unneeded, space wasting virtual keypad that appears on many phones. This is an unsigned app. Your phone may prompt you for permission to use the camera, file system or Internet. If the prompts get annoying or if this version doesn’t work properly on your phone try downloading the Facebook app from the official Facebook download page at https://d.facebook.com/install using your phone browser. On the other hand, if Facebook says your phone isn’t supported try the version on this page, it works on many phones that Facebook doesn’t officially support. The app “Facebook” (149 KB) is ready to download or send to your phone as filename:”facebook341″. Working on my nokia c5-00.2….! I don’t understand your qiestion. This post is about a Facebook app not a browser. What are you trying to do when you get the error? What phone are you using? How can I save or download photos from this version? I’ve never heard of a phone called “mobile No 3.3.1”. Please tell us what brand and model phone Facebook 3.4.1 doesn’t work on. Keep in mind, you can only change your name every 60 days. You need to use the Facebook web site to change your profile name. 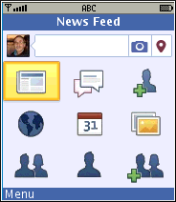 Why can’t i change my facebook profile name in facebook version 3.4.1? i have used samsung gt c 3530 mobile but facebook not working. Finally Im able to use facebook on my Nokia feature phone And its fast supporting app..